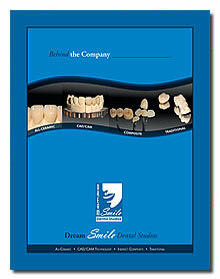 The Colorite Porcelain Veneer System coordinates a full range of veneer porcelains and duplicating materials developed to provide comprehensive porcelain veneer capabilities. The system provides high chroma, exacting shades and controlled translucency levels. 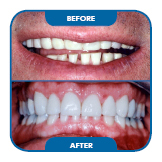 This comprehensive system features all 16 Vita® shades, special incisal, and modifier porcelains to alter the chroma or translucency. Standard shade prescriptions are a snap to create “out of the bottle” while more challenging cases are completed with this logical approach to color. 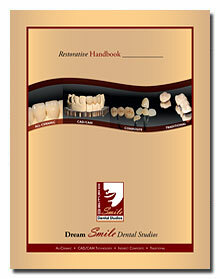 The Dream Smile Cosmetic team has mastered the use of the Colorite system modifiers to adjust the dominant hue of selected shades or to create a cervical effect and random accents, and the system incisal porcelains too, to individually or alternated vertically imitates rod formations. 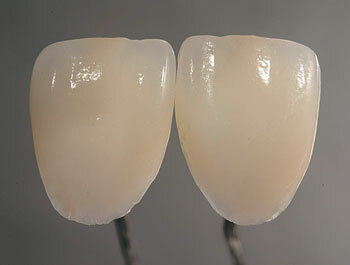 Violet incisal is ideal for creating the illusion of translucency.